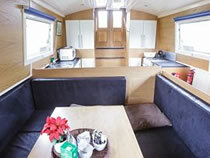 This class of canal boat can sleep up to 9 People. 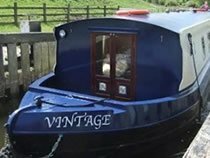 DESIGN: A luxury widebeam canal boat ideal for large families and groups. The interior is designed to give maximum social and communal space. 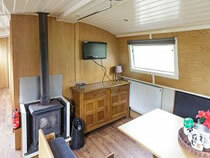 This boat has a real fuel stove and radiator central heating throughout. Karndine flooring throughout. 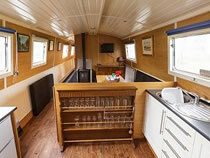 FEATURES: Bright, spacious saloon at the back of the boat with plenty of communal space. The seating can be converted into a double bed and a single bed in the evening, if required. Solid fuel stove. KITCHEN: Well-equipped galley with 4 burner gas cooker complete with grill and oven, refrigerator, sink and drainer, work surfaces and storage space. There is kettle and microwave in the galley. Sufficient saucepans, cooking utensils, crockery and cutlery etc. for the number of berths. 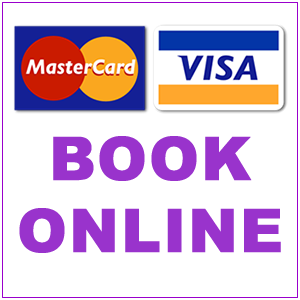 BEDDING: Mid cabin with fixed double bed and en-suite shower and wash basin. 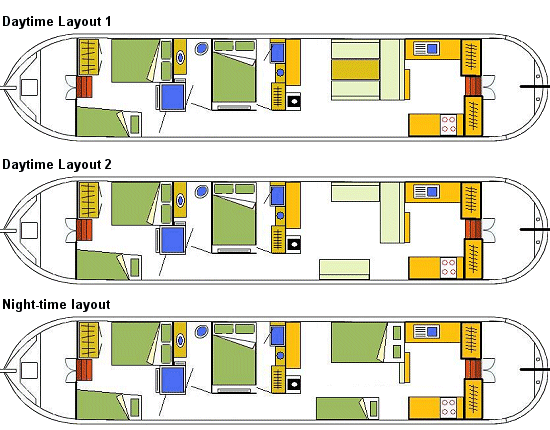 Forward cabin with one fixed double bed and bunk beds. All beds have memory foam mattresses and all are 6ft 3in long. Bed guards are available on request and a baby travel cot is on board. BATHROOM: Family shower room with shower, toilet and was basin. En-suite shower and was basin in mid cabin.